The oldest son, Manuel Jr., leaves home at 16 to join an apprenticeship program in blacksmithing and wagon building at Mission San Jose. He meets Margaret, his future wife, and before long the newlyweds are headed to Hanford, and then Selma where they establish a blacksmith shop. After nearly ten years, Manuel Jr. looks over to the little burg of Reedley, rising from the wheat fields in the east, and decides to make another move. He becomes Reedley’s first blacksmith and the Studebaker Wagon dealer, and in the Enos tradition, raises a family of nine. Reedley’s first major fire destroyed the east side of the 1100 block of G Street. This included the Reedley Exponent building, so you could really say, “the news was hot off the press!” Reedley was just four years old. The second major fire was at the turn of the century. The foundry at Alta Machine Works set fire to itself and this time the west side of G Street’s 1100 block was lost, including the machine works, foundry, water tower, bank and numerous outbuildings. Manuel Enos organized a bucket brigade to try and contain the fire to just that block. As the fire lay smoldering, the townsfolk realized that the only way Reedley was to survive was to have a better way to fight fires than with just buckets. Manuel Enos was elected fire chief and a group of civic minded citizens made up Reedley’s very first Volunteer Fire Department. A fire hydrant was soon installed on the corner of 10th and G Streets, and a hand-drawn hose cart with hose was purchased for the volunteer firemen. Remember this was the turn-of-the-century (1900), and the water tower was nothing more than a tank house where the tank was filled by windmill or maybe a small “hit and miss” gas engine with a pump to lift the well water up to the tank. The water pressure in your house (in the City limits) was provided by the volume and gravity of the water in the tower’s tanks. The stream in this early fire hose depended solely on gravity. The next piece of equipment purchased for the volunteers was an acid fire extinguisher—again hand-drawn. To activate the extinguisher, it had to be turned upside down so that the acid ate through a seal, allowing it to mix with soda that expanded, forcing water out the hose nozzle and propelled it toward the fire. This type of extinguisher worked very well on paper and wood fires. This was the equipment the City had available for the next major fire that took out Simpson’s Hotel and Green’s Pharmacy in 1910. Fortunately, a brick building acted as a fire block preventing the fire from taking the whole city block. 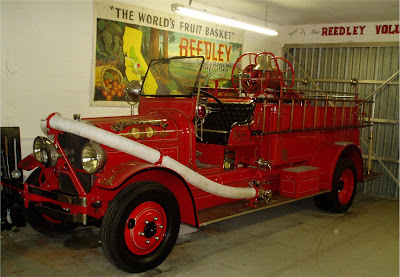 In the teens, Drake Manufacturing Co. would take a Hudson touring car and convert it into Reedley’s first motorized fire truck. This gave the Volunteers the capability of pressurizing the water coursing through the fire hose at a higher, constant level. In the 1920s, two Ford-built Model T trucks were purchased, with at least one of them using the “acid” principle of propelling water through the hose. 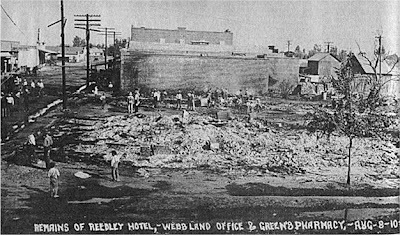 During the Grand Hotel fire in 1929, it was obvious that the City of Reedley was in dire need of a “real” fire truck. In one photo, it shows an auxiliary pump between the hydrant and the hose nozzle. I’m not sure how effective this was. Fortunately, the volunteers were able to contain the fire to the roof and third story. Not long after this fire, a fund drive was started to buy a new fire engine. The new Seagraves fire engine debuted in 1932, and really showed its stuff on the 1933 fig cannery fire. This was one of Reedley’s largest fires, but little was written about it. Bob Melgard, who lived near the cannery on South Reed, filled me in. By this time, Reedley had two water towers. In 1936 the City purchased a Dodge truck chassis and it was fitted out in-house as the Number 2 Engine. 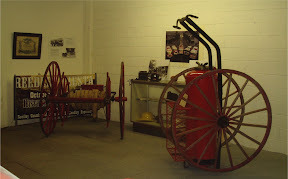 One of the Model T’s was sold to the Parlier Fire Department and it still exists today. When the piercing whine of the fire siren burst to life, it didn’t mean it was time to race the fire trucks to the fire; no, just like in the 1930s, regular traffic was to pull to the curb and stop, yielding the right away to the volunteers so they could safely get to the fire house. Traffic was to remain stopped until the siren stopped, signifying that all the firemen are on the job. When the siren first started blowing, the fires were mainly packing sheds. With both Southern Pacific and Santa Fe railways going through town, Reedley had plenty of packing sheds lining both tracks. Packing sheds were vulnerable because they were made of wood; the floor height lined up with open box car doors and bobtail truck beds that delivered fruit to be packed. They were also filled with wood packing boxes or other flammable packing materials. Peach fuzz and other debris would sift down through the floor boards, collecting in piles. It only took one careless smoker to drop a cigarette through the floor, where the pile of fuzz would smolder for a while and then everything would go up in flames. Manuel Enos’ sons, Leo and Louie, worked at the blacksmith shop after school and on weekends. When they graduated from Reedley High, they joined the business, becoming Enos and Sons. The boys were also on the volunteer fire department. Manuel passed away in the early 1930s, and Leo moved to Sanger to start a shop. Louie continued to live in Reedley. He married Druisilla Dunn and had two children, breaking the Enos family tradition of nine. He continued to be a loyal volunteer fireman. I resided in Reedley for 10-yrs. My father was one of two dentists practicing in the area at the time (1960’s). When he passed unexpectedly my mother moved us all to the Los Angeles area, closer to her relatives. I remember the water tower siren going off and all us kids running to the corner to watch the trucks roll. An open cab GMC pumper was the “state of the art” equipment for the city with the older trucks in the 2nd row of the station and a Mid-Valley Fire District covered cab truck stationed next to it. Good ole days. This was my great grandfather. Thank you so much for the article.